Welcome to OSU Rugby! We are a Player-Centered program, encouraging success on and off the rugby field through commitment, integrity, humility and a strong focus and work ethic. That’s the spirit of our team. At OSU, you’ll be surrounded by a collective character of determination and strong work ethic, humbly and passionately driven to achieve success through commitment, integrity and service. You’ll find those same values in the OSU Rugby Club. Our Season runs from late September-April with breaks reflecting the academic calendar: 15’s rugby September-early March and 7s rugby in April. We compete in the Northwest College Rugby Conference with university teams throughout the Pacific Northwest. Practices are conveniently structured in the evening for students with busy schedules to support your academic and work commitments. We practice 2-3 times a week typically from 6-8 pm (at Truax indoor field on Tuesdays). 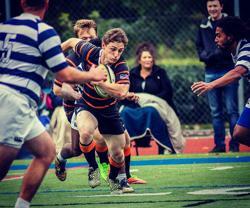 ©2019 Oregon State University Rugby / SportsEngine. All Rights Reserved.